Today may be the nastiest winter day ever, at least in my memory. There is a thick and wet sheet of ice over everything, we cannot get to the car or close to the pasture, unless we veer through the deep snow. I’ve been forbidden to go outside and do anything, and I’m not fighting it. Maria is lighter and has killer snow boots. These restrictions made me feel vulnerable and unhappy. But I accept them. I know what it means to fall. And you don’t want to fall on that ice, for sure. I admit to fantasies about New Mexico, and even the a beach somewhere along the Atlantic Coast down South. Where it is warm, and I can walk. For some reason, I never wish to live in Florida, I’m not sure why. We’ve been trapped inside the house all day, no movie, no eating out. I get to cook. It’s kind of special. We are cut off from the world, we can’t really go anywhere, the snow and ice continue to fail, Two people in love, alone, isolated from the world, that is beautiful. There is nothing to escape too, for all the grayness and cold. This is where I would escape to. Maria and I do not tire of one another, and she is buzzing around the house tending to plants, sketching, reading, talking. We’re thinking of playing chess tonight, or looking for a worthy move on Netflix. Or just reading. I’m cooking fish tonight for dinner, salmon for her and Haddock for me. We did find something strange on Netflix, a Spanish movie about a rebellion in Morocco.. Then I actually got on my stationery bike and read. Maria is feeling better, she is over her bug or her cold, a bit pale but just about normal. We dropped plans to go see “The Shape of Water,” it was just too risky. Got some new novels to read, eager to get to them. More later. The challenge of this wet nasty day is that it forces me to consider where I am and if I secretly – or openly – want to change it. The answer is no. On days like this you have to look inside of yourself, or at least I do. Milan Kundera wrote in The Unbearable Lightness Of Being that the person who longs to leave the place where he lives is an unhappy person. I have been an unhappy person, and for much of my life, yearned to leave the place where I lived. It is sometimes valuable to realize how unhappy you are, and I left that place and came here, to this remote and isolated and cold place, where I became happy. And I am sure. I am happy, and do not ever yearn to be somewhere else. There is a lesson in that, and I finally learned it. I’ve learned that many people are always shouting that they want to change, to leave, to move, to create a better future. It’s not always true The past is bursting with life, the future is a gray void, empty and dark, of little interest to me. The past is eager to irritate and upset me, provoke and insult me, tease me with regrets and the thought of destroying or repainting or re-imagining it. Sometimes I think of all the things I would do differently, say differently, think differently. What an empty vessel that is. The only reason I can think of to be a Prince of the Future is to somehow change my past. For me, there is no other reason, and that is not a good enough one. Thanks to the Nastiest Day for reminding me where I wish to be. Two people in love, alone, isolated from the world. We had a horrible ice storm in Lexington, Ky and our electric power went out for a few days. But, because we live in an old building we still had gas and I could cook by candlelight, and we lit candles, and talked through the dark night. I loved this moment in my history. Quiet, darkness. 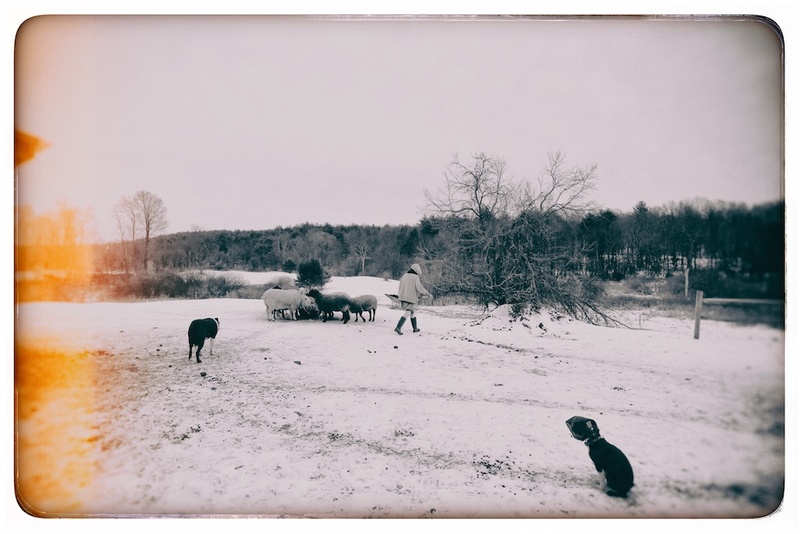 a long ago winter day in rural far upstate N.Y. when the children were young. against a winter grey sky. it about in mist like baby powder. snow pellets hitting the glass. thier ears twitch at the word bacon. to the floor from small hands. on this wet, dreary evening. Bless you, this brought tears to my eyes in remembering those days in my life..
Maybe this afternoon, Kim, the ice is still awful here, but I do think we need to get out of the house..thanks for the note.